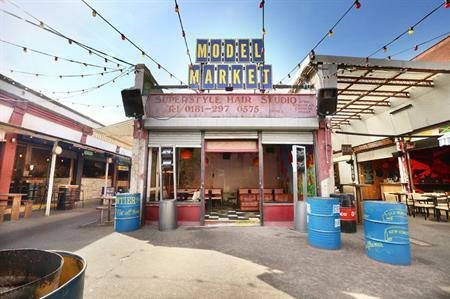 Model Market, a 1950s-style market transformed into an events venue, has joined the London Union portfolio and is available for hire. The south-east London venue was a derelict 1950s market, which has been revamped to an events venue with the capacity for 800 delegates. The venue also features ten streetfood micro-diners and five different bars. Model Market features flexible event space that can cater to parties, product launches and teambuilding, offering a range of spaces and venue hire options for event professionals. Its range of bars include the Lewisham High Line rooftop bar, which can cater for outside events for up to 100 delegates. It also has Rum Shack, Craft Can Beer Bar and a wine bar, Winyl. Event bookers can also hire Model Market’s line-up of street food traders including Club Mexicana (vegan tacos), Rola Wala (mini Indian naan sliders), Up in My Grill (steak and chips) and Hotbox (all things meat). The venue is available for event hire from May to September and is a short walk from the Lewisham DLR and train station. Emma Howe, sales director at London Union, said: "Model Market is a great addition to our summer offering for event bookers. The space is completely unique within our portfolio, offering a more intimate Street Feast experience in comparison to our bigger venues, which can hold up to 3,000 people."